A panel co-sponsored by the Center for Social Concerns and the Institute for Latino Studies discussed what it means for a city, state, university or faith-based organization to be declared a sanctuary, and what the implications of using the “sanctuary” designation might be. 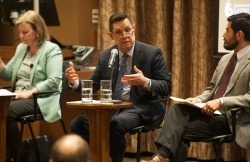 The moderator, director of the Center for Civil and Human Rights Jennifer Mason McAward, led the panelists, who included co-director of the Institute for Latino Studies Luis Fraga, professor of law Rick Garnett, graduate student Leo Guardado and professor of law Lisa Koop. While the idea of sanctuaries began as a religious term, Guardado said, it began to be used in a more secular sense around the 1980s in Los Angeles when some churches declared themselves sanctuaries regarding the immigration statuses of Central Americans fleeing from civil wars. Currently, according to Fraga, four states, 364 counties and 39 cities are classified as sanctuaries. In addition, some universities have begun to follow suit, with between 150 and 200 universities applying the term to themselves. The negative consequence of declaring a campus a sanctuary campus is that it could subject the university to a loss of federal funding. For this reason, some colleges, according to Guardado, prefer not to use the term, while they may still identify with the ideas of being a sanctuary campus. Guardado said he sees great benefit in using the term, however. Ultimately Guardado said he believes it is a “strategic choice” to use the word sanctuary. The issue of sanctuaries is especially relevant given that a new president is about to be sworn into office. Koop said under the new administration, residents might see an increase in home raids, collateral home arrests and fast-track deportation. “There is already an enforcement apparatus in place. This is all happening under the current administration. What we expect to see in the coming months and years is potentially significantly more aggressive enforcement and maybe increased enforcement and increased criminalization of non-citizens,” Koop said. Garnett concluded the panel by citing the implications of using religious freedom in declaring sanctuary. He said recently, there has been a resurgence in communities invoking religious freedom. “If that development continues, I think that could be really fruitful for religious institutions, particularly universities,” Garnett said. Originally published by Muck, Alexandra at latinostudies.nd.edu on January 19, 2017.